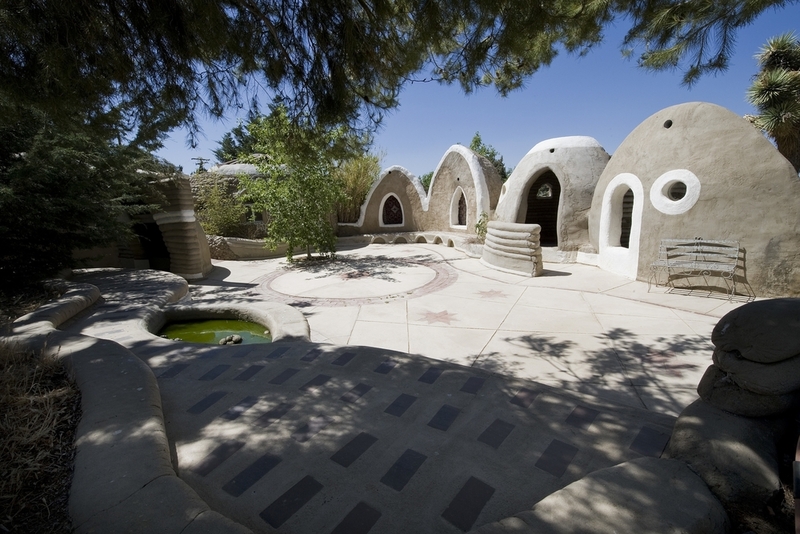 The CalEarth campus in Hesperia, California has been a center for research and teaching since 1991. 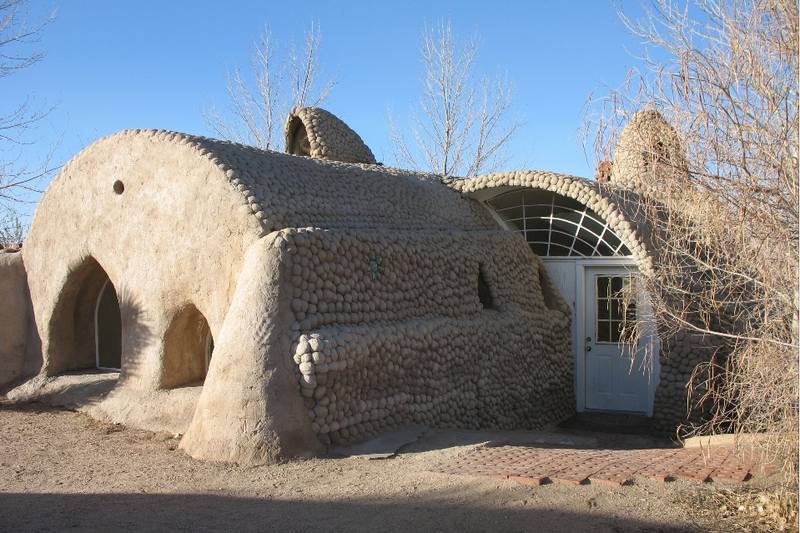 A walk around our campus is a walk through the historical evolution of SuperAdobe building technology--many buildings have been standing for over 20 years and we continue to watch and learn from them. The building designs range from a small emergency shelter for one person that can be built in a day to form temporary villages, to a 3 bedroom 2 car garage home, all built using the same principles. 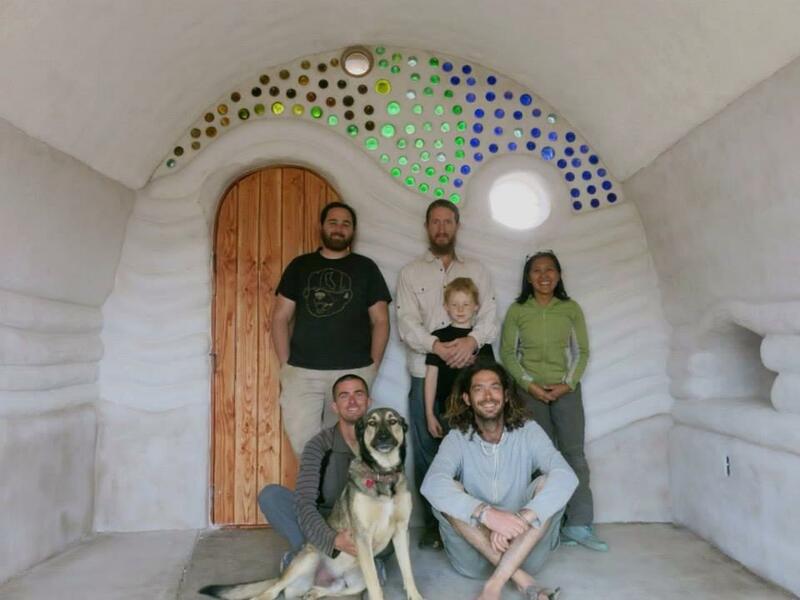 The Eco-Dome is a 400 square foot structure featured on HGTV Tiny House Hunters and CNN. It is a spacious and energy efficient “tiny” home that includes a rocket mass heater and a passive cooling system called a wind scoop. The Eco-Dome is engineered to surpass all structural building codes and has been permitted and built in various locations worldwide. 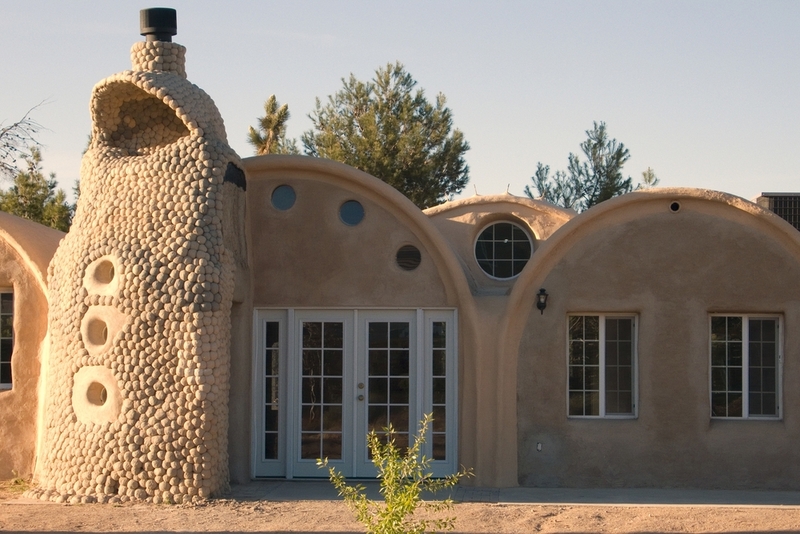 Eco-Dome is a modular design, and commonly built as a “Double Eco-Dome” to provide additional bedrooms. 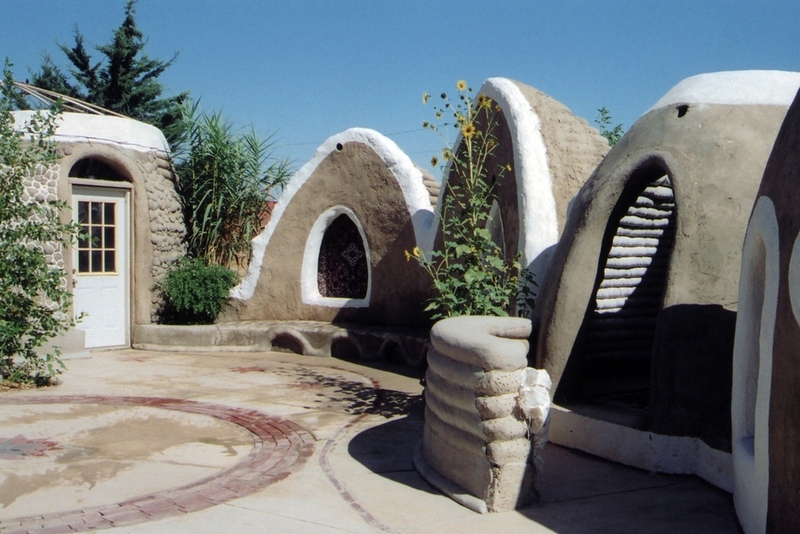 Some examples of the larger design can be found on the Superadobe Worldwide page. Blueprints and Engineering for the Eco-Dome are available for purchase. Earth One is a 2,000 sq. ft home including 3 bedrooms, 2 bathrooms and a 2 car garage in a 9 vault design. Earth One was fully permitted by the building department and received a residency permit in the City of Hesperia in 2007. 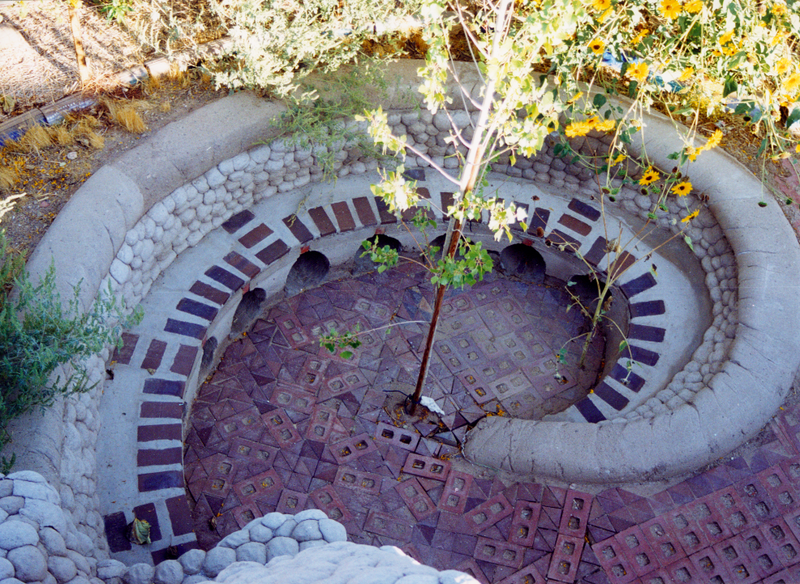 The walls are built with SuperAdobe and the slabs are stabilized earth poured over a form which is then removed and re-used to build the next vault. 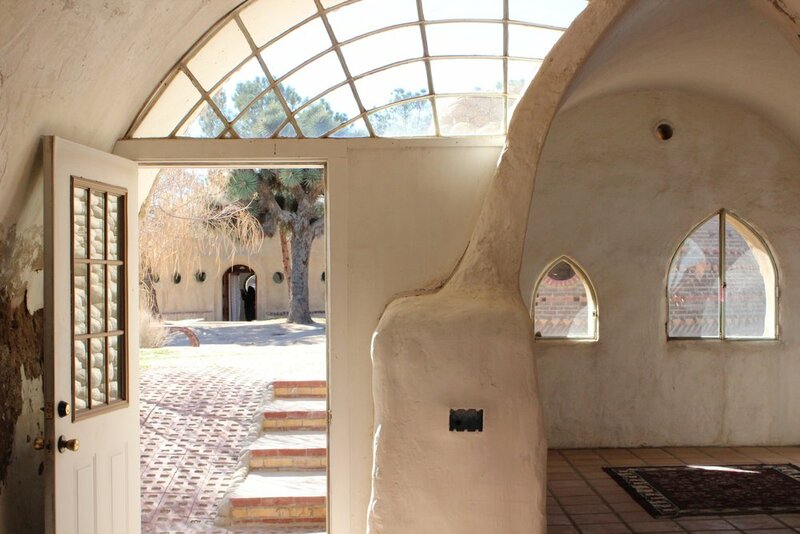 Earth One features all the standard amenities (heating, air conditioning, fire place, full kitchen) to demonstrate the ability to integrate standard technologies into SuperAdobe architecture. The building also features a radiant floor slab heated using solar panels placed at the back of the house. Earth One is a modular design, and comes in multiple configurations with varying numbers of vaults depending on the size needed. Blueprints are available for sale, we recommend speaking with your local building department before purchasing. 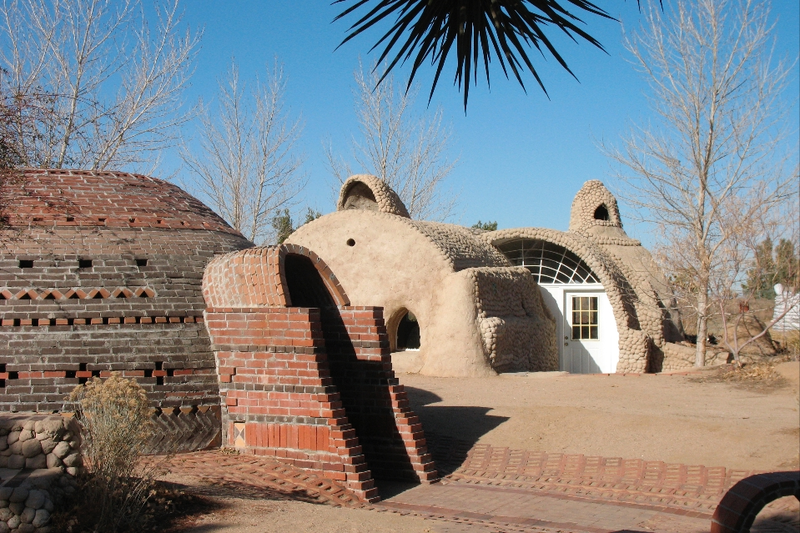 Earth One was featured on an episode of HGTV Extreme Homes in 2014. The "Water Village" is the first of two emergency shelter villages at CalEarth. 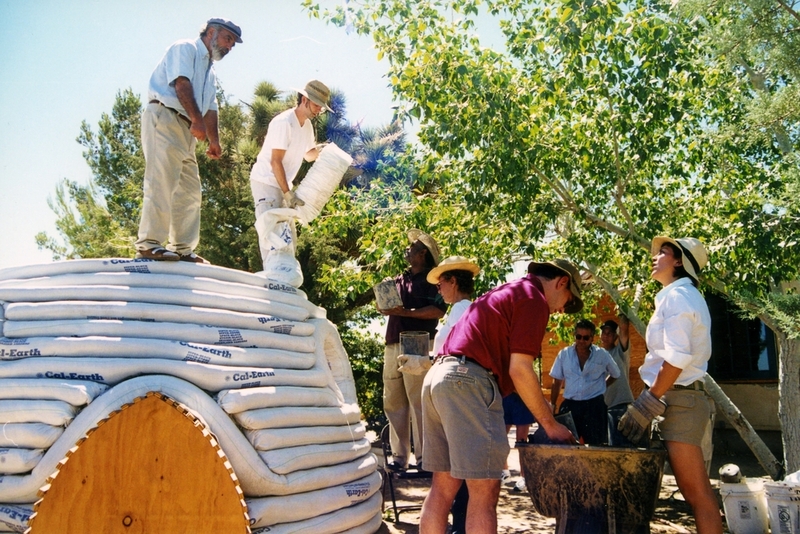 In July or 2001, a visit from the United Nations headed by the Director of the UNDP Emergency Response Division with his team from New York, participated in a CalEarth workshop for these emergency shelters. They each slept in one to experience their quality. Their very positive response was recorded by the Reuters World News Agency. 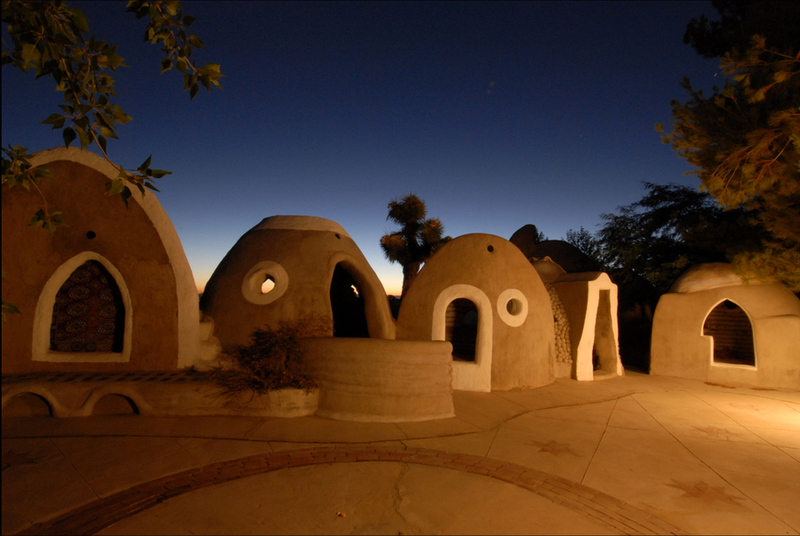 Each dome in the village has a slightly different design to show the versatility of SuperAdobe, but also the simplicity. 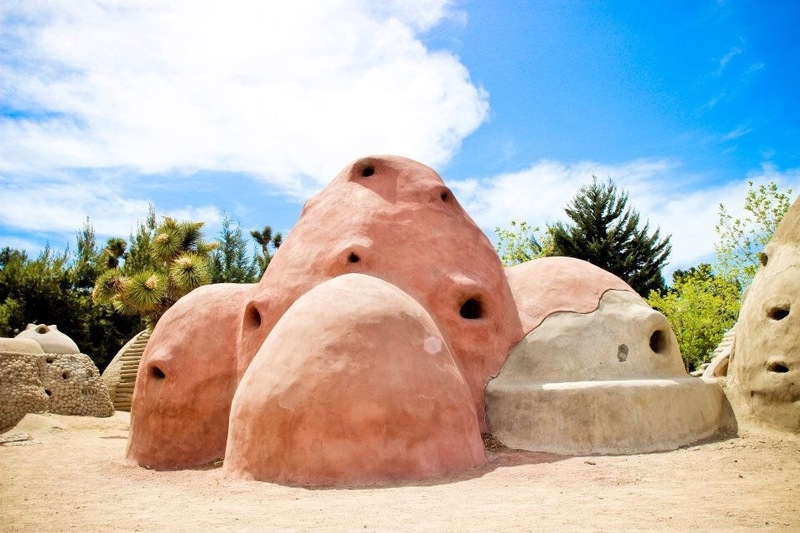 These small domes can each be built in about one day with 5-7 builders with only basic on-site training. 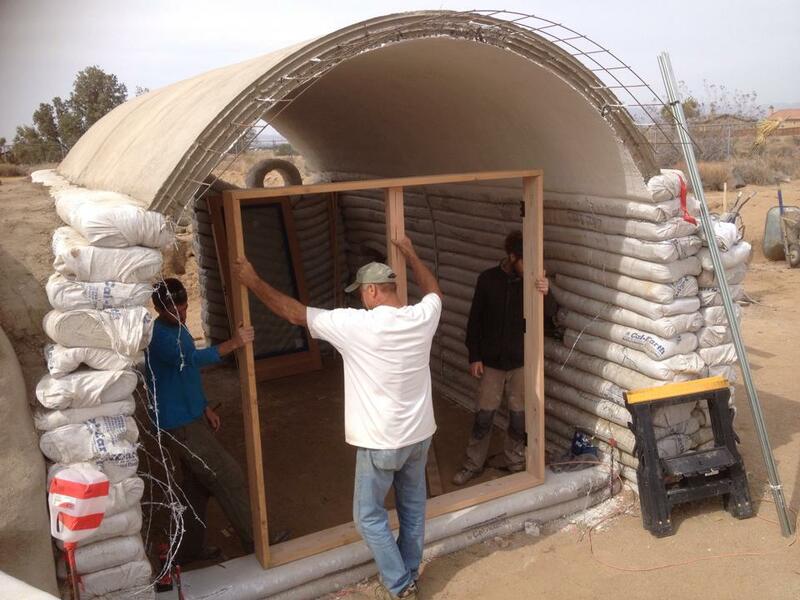 They can be stabilized and plastered or just left unstabilized for temporary shelter in a disaster situation. 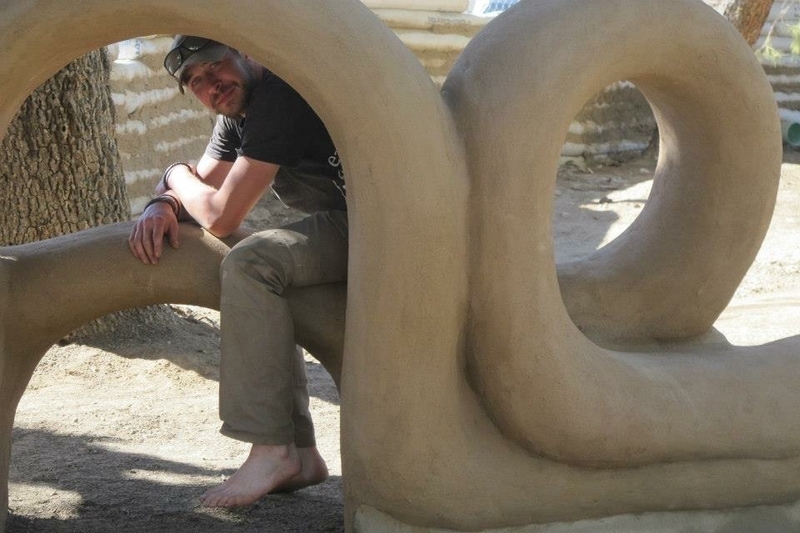 In our "Core A" Dome Building and Core Curriululm 4 day workshops students learn to build these small shelters. 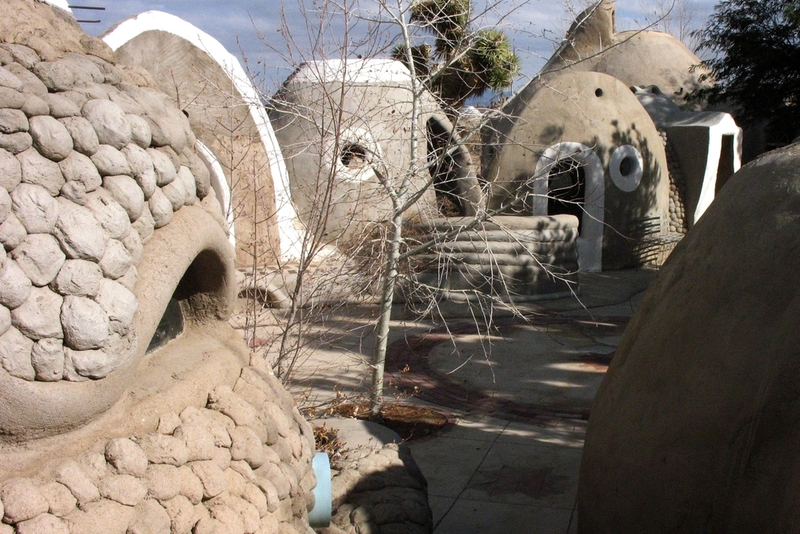 The fire village was built one dome at a time by various workshop groups over a three year period. Many of the domes in this village include some of the first ever rocket mass heaters built at CalEarth (some work better than others!) as part of our ongoing research to integrate sustainable systems into this architecture. 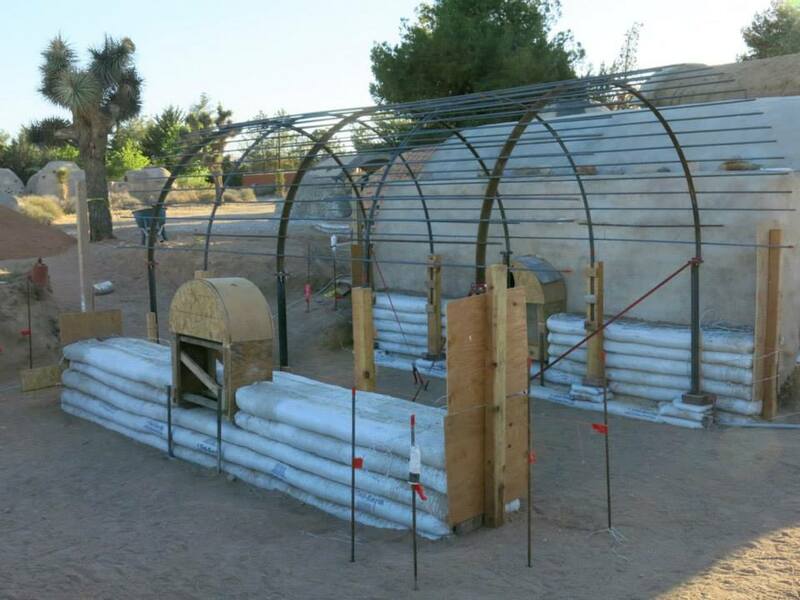 There is also a sweat lodge design, a shower dome design, and other concepts being tested out for temporary/semi-permanent community living spaces. The goal is functionality and to allow different spaces for private use and community use that can all be built very quickly by the individuals who will be living there. 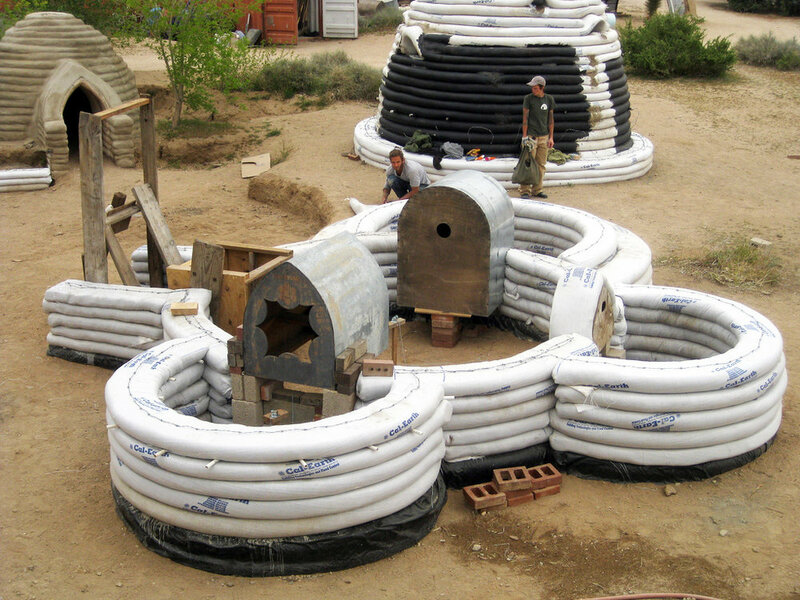 After the devastating earthquake in Haiti in 2010, CalEarth was invited on a research trip to design a possible temporary housing alternative for individuals who lost their homes and were living in tent villages. After speaking with many families living in these camps, we returned a designed a structure based on their requests. 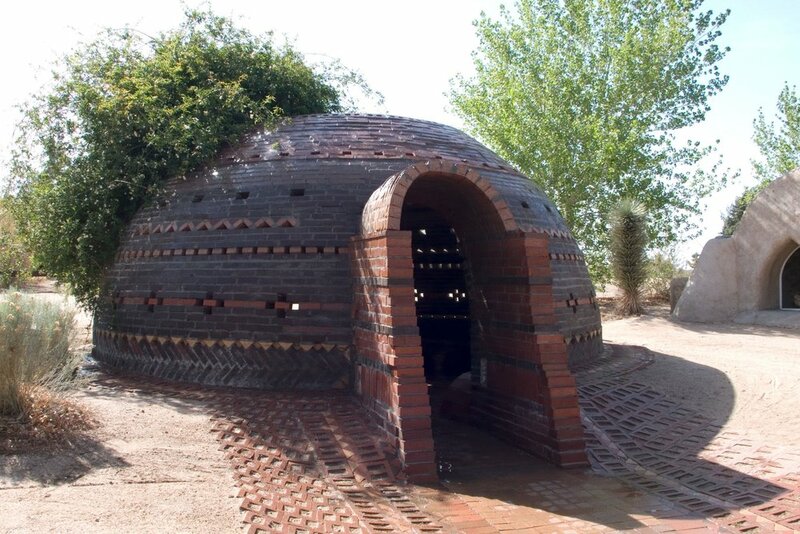 As an alternative to our single dome designs, this structure includes a 10 foot main dome with 3 small apses, one for a sleeping nook, one for a cooking surface, and one for storage. 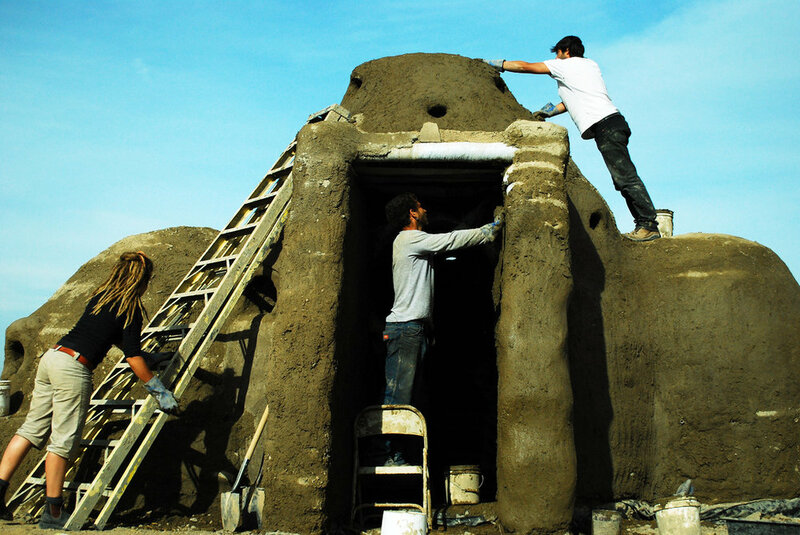 It also includes a rocket stove, a recycled door made from pallets, and small window openings using PVC pipes. Two separate groups returned to Haiti and built multiple domes for families who lost their homes--see the Relief Initiatives page for more information. 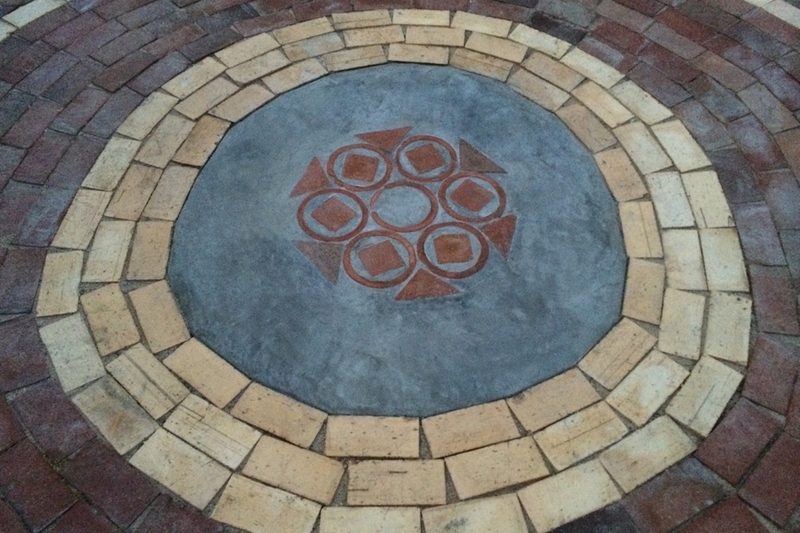 The "Water Vault" was named by a group of long term apprentices who completed this single, standalone vault in 2015. 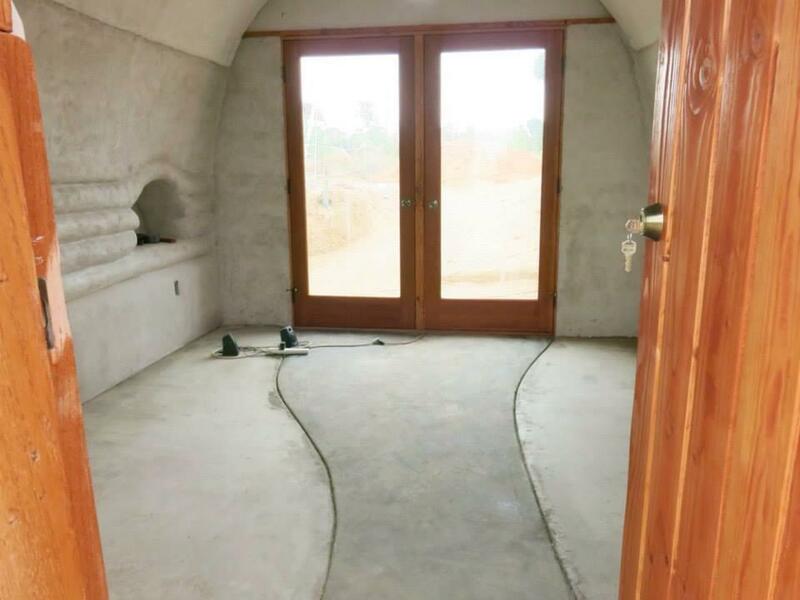 In our advanced long term program offered in the Spring, students who have completed our apprenticeship program have the opportunity to design and build a vault similar to this. The vault includes a south wall designed for maximum solar gain, as well as an insulated floor slab to retain heat and maintain consistent temperatures. 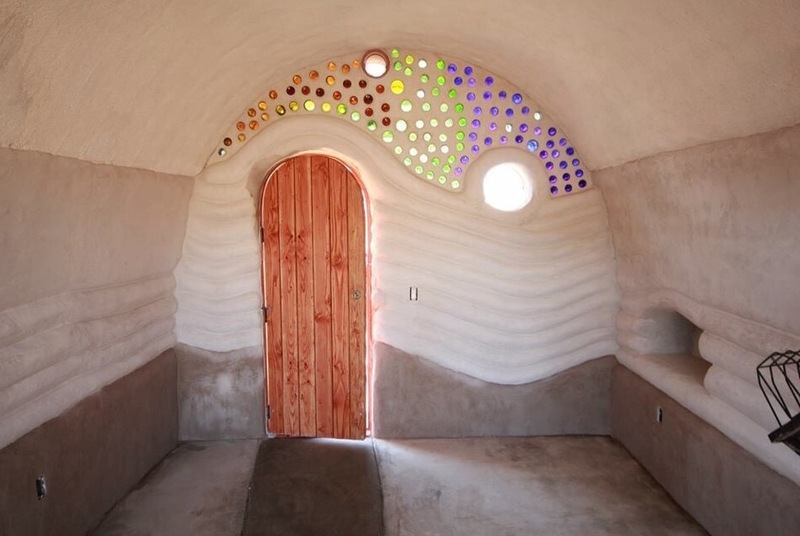 The door is made from recycled wood and the glass design uses recycled bottles. You can watch the time-lapse of this vault being built over 21 days as well as see additional photos and information shared by the apprentices involved on their Facebook group page here. 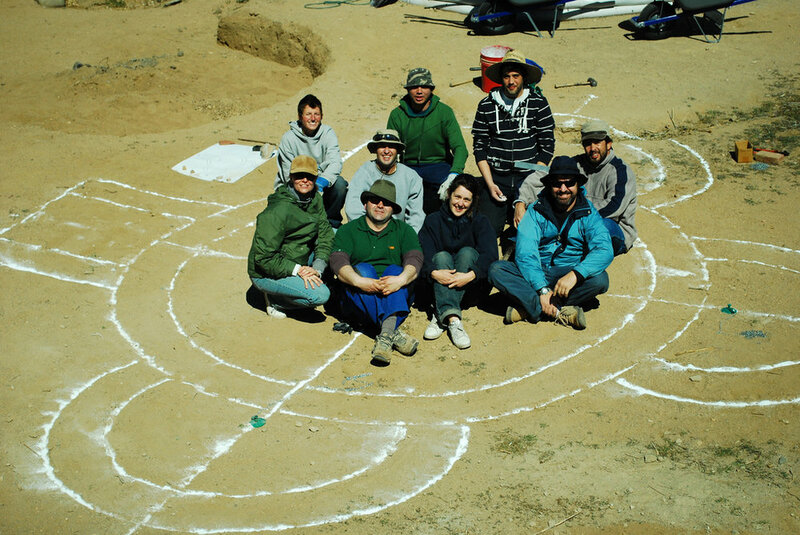 The triple vault was the first vaulted structure built at CalEarth in the early 1990s. The walls are all individual sandbags (unstabilized) and the vault slabs were poured in small 3-4 feet increments. This building was tested in 1995 and passed the full set of seismic tests required in the state of California. 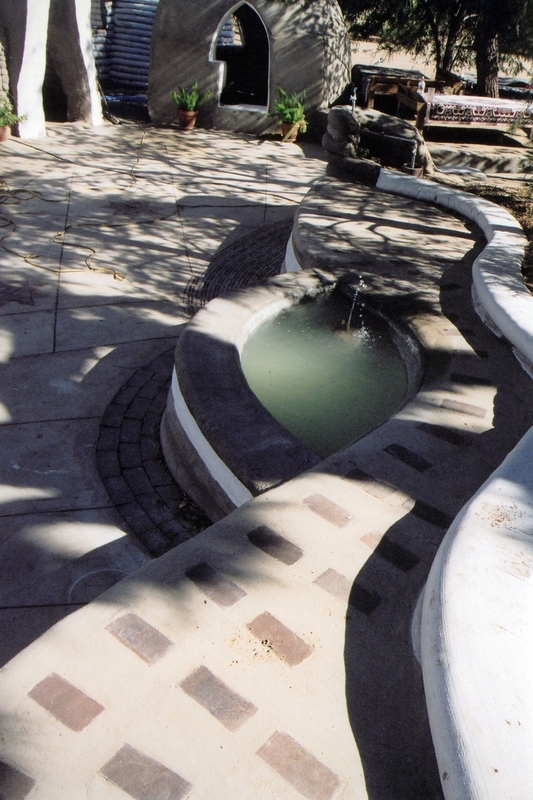 This design was later evolved into the Earth One design, which uses the same stacked vault layout to create flow between spaces without the need for hallways. 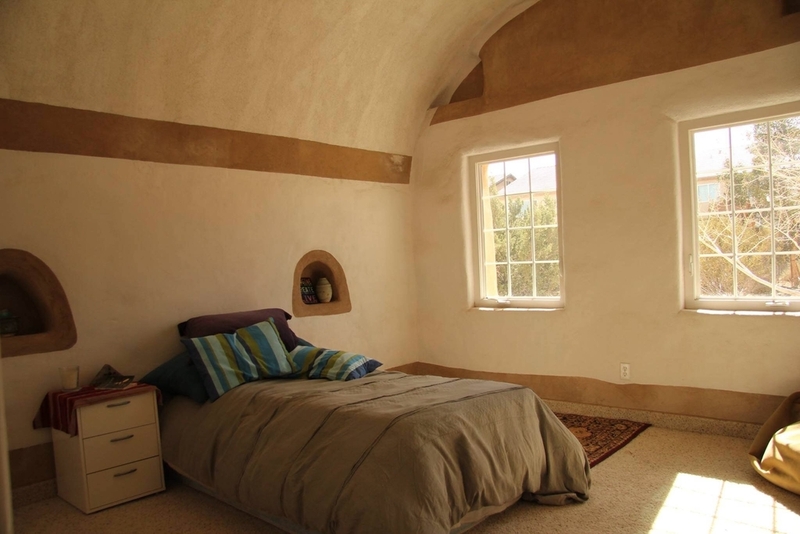 The Triple Vault also features the first wind scoop built a CalEarth, a passive cooling system that brings in the air and circulates it throughout the space without the need for an air conditioner. 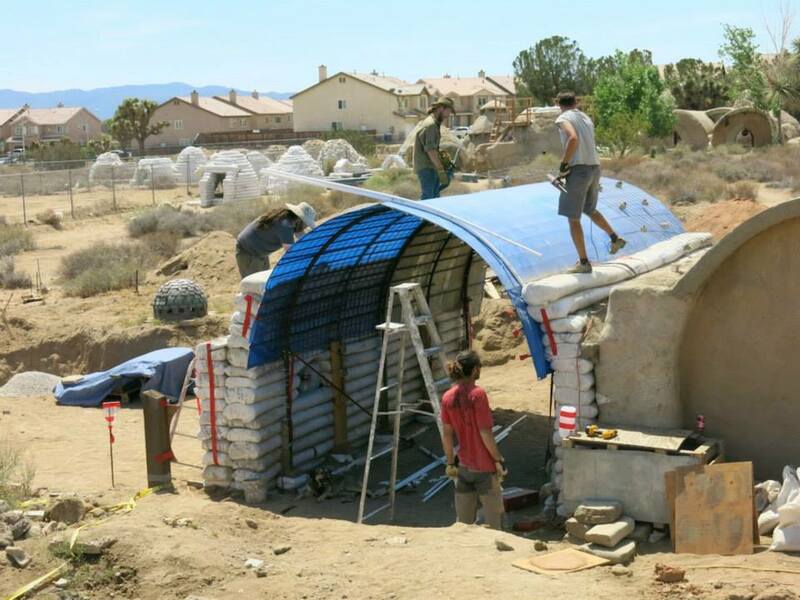 The Triple Vault is submerged 3 feet below grade, a design that is especially useful to combat the extreme temperatures in the Mojave desert. 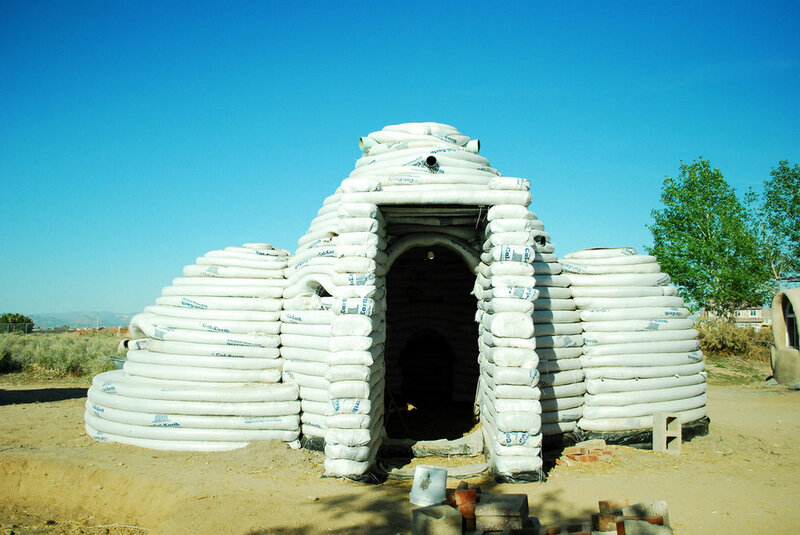 Mars One was the second sandbag structure built at CalEarth in the early 1990s using individual rice bags filled with sand (unstabilized). 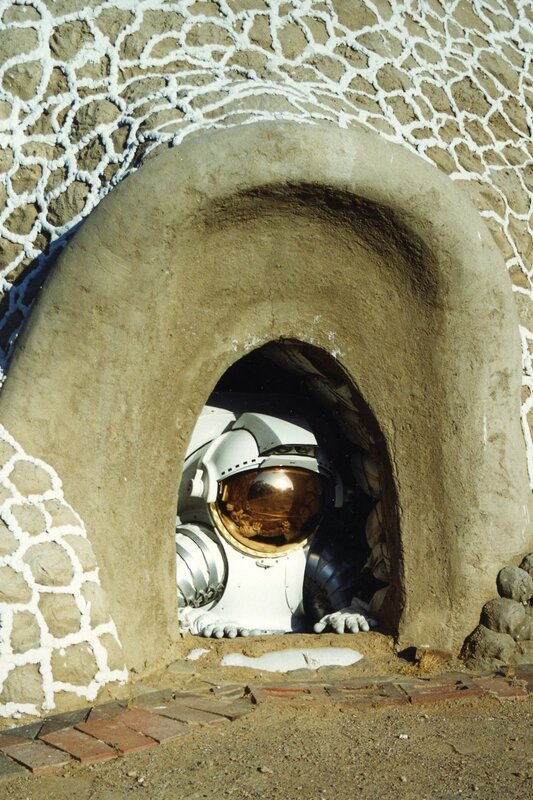 In 1984 Nader Khalili presented at a NASA symposium for lunar and martian construction, sharing his ideas of both ceramic style architecture (link to ceramic houses book) as well as "velcro adobe" which later became the SuperAdobe building system. Mars One was a prototype for a lunar/martian colony design, and includes a handmade skylight and a small sitting nook as well as a fireplace. 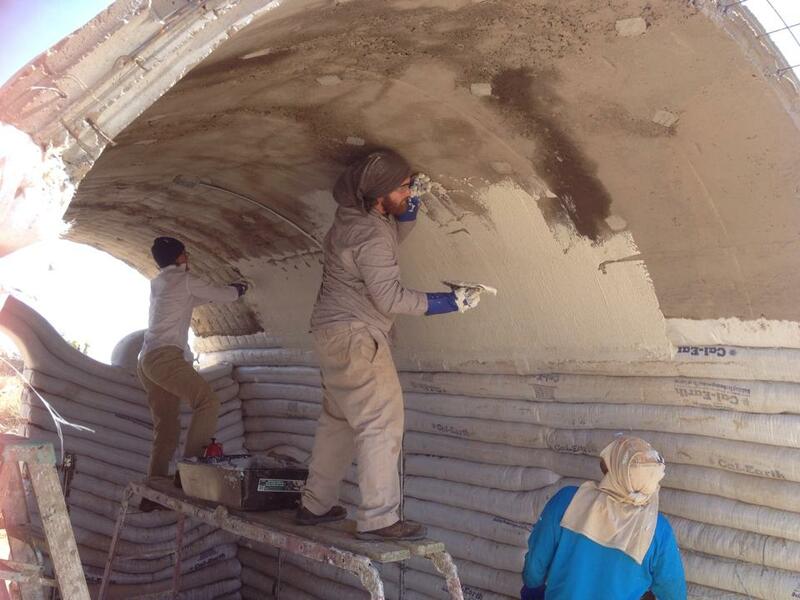 Mars One was also the first structure to include "reptiling" plaster, the small earthen balls used to cover the exterior of the building providing an extra layer of protection and eliminating smooth surfaces prone to cracking. 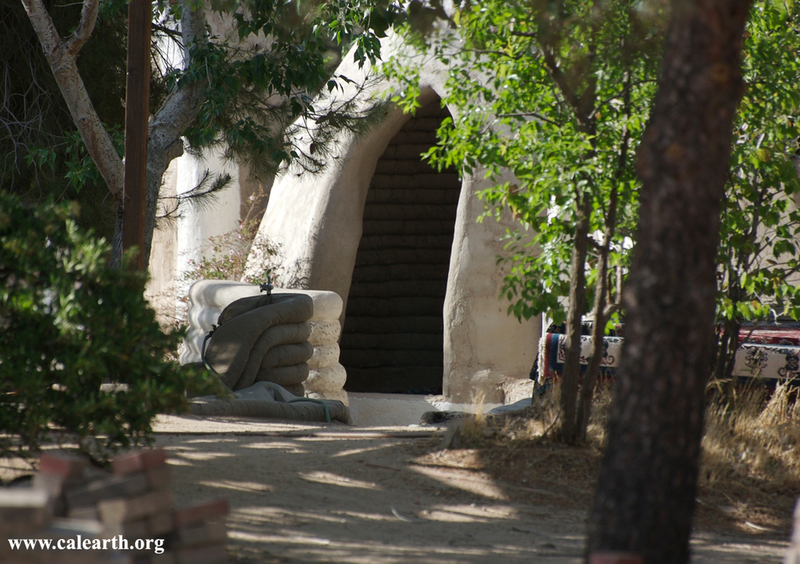 Just like many of the buildings at CalEarth, this structure has been left in its original form to observe and research over time. 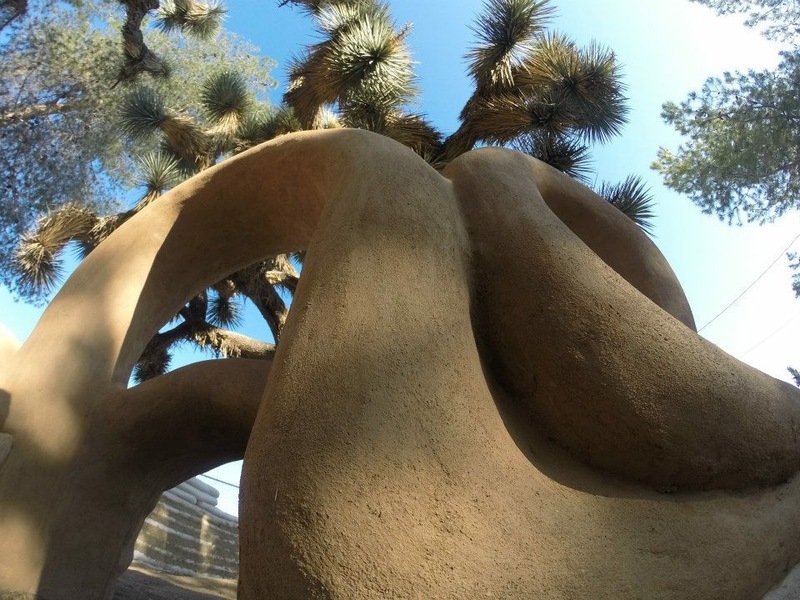 In 2015 two CalEarth alumni with a background in fine art, Laura Smith and Caitlin Deane designed and built a sculpture garden at CalEarth. Their goal was to create a space that fosters community, interaction, and conversation. These three art installations are all built with SuperAdobe technology and push the flexibility of the bags, shapes and forms. 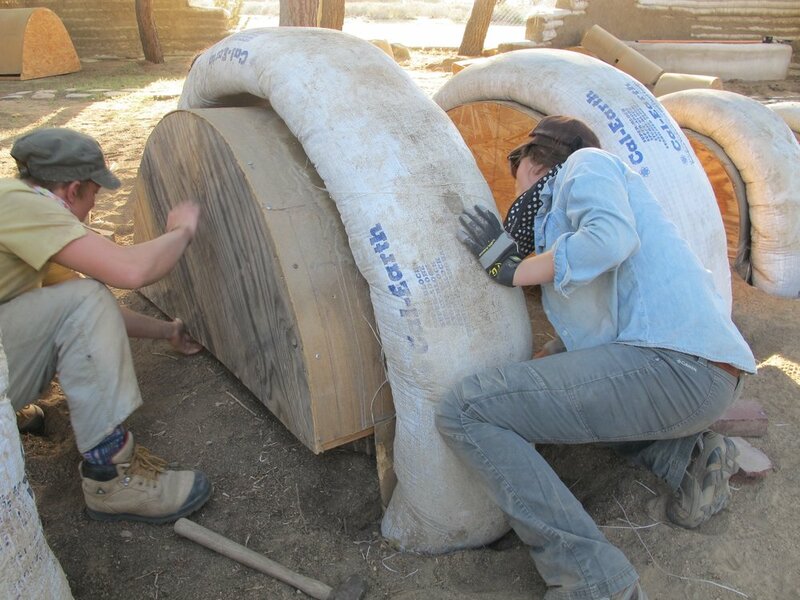 Laura and Caitlin wanted to explore what the earth bag is capable of, and inspire others to see how earth architecture can be simultaneously playful and functional. 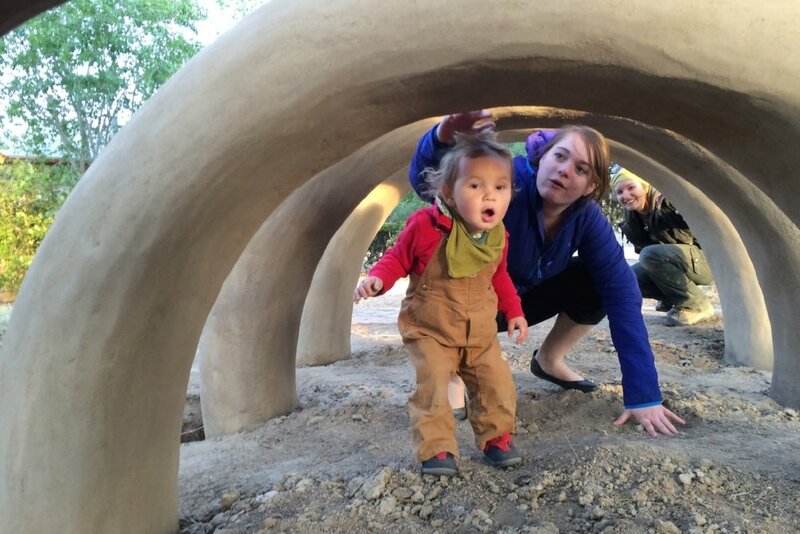 The sculpture garden became an instant hit with our children and adult visitors alike! The Rumi Dome is named after Nader Khalili's favorite Persian poet, Jalluladin Rumi who lived nearly 800 years ago. This dome was built by a handful of students with no masonry experience and a paintbrush extender mounted to the center as a compass. The bricks were all donated from the Higgins Brick Company as they were all reject bricks (incorrect size, shape, color). The design for all the holes and spaces was meant to simulate a film strip so as you turn in a circle you can see outside consistently. The design also allows for climbing the dome from the outside, one of the most favorite activities for all our youth (and adult) visitors. 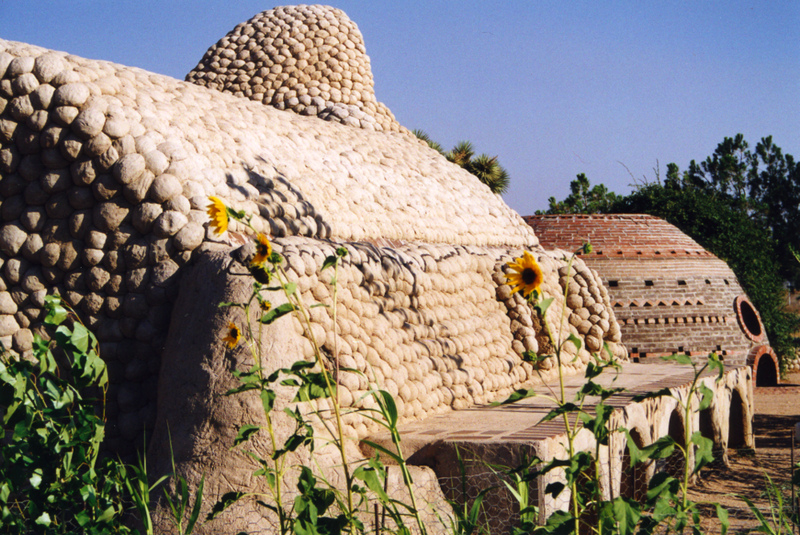 The Rumi Dome at Hesperia Lake was built as part of a Museum and Nature Center project planned by the City of Hesperia in the mid-1990s. While the plans ultimately shifted, the Rumi Dome still stands 20 years later. 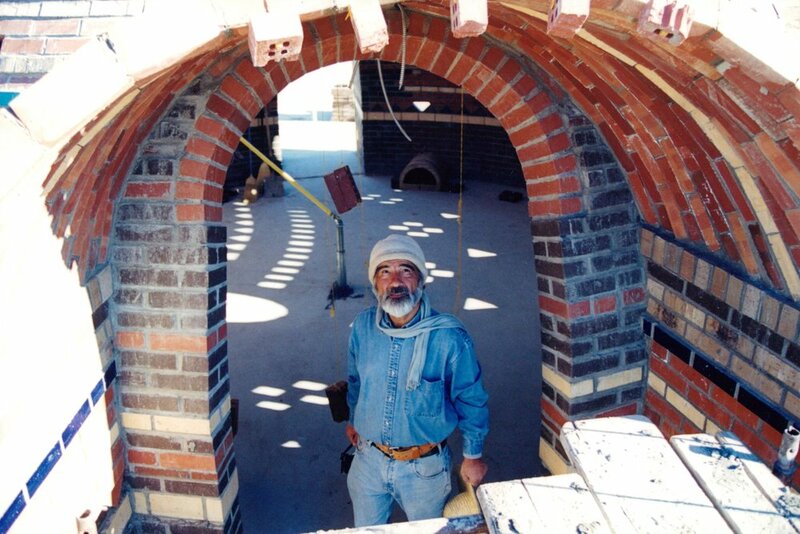 Larger than the Rumi Dome at CalEarth, this dome features two entrances and multiple rows of colored glazed bricks in beautiful symmetrical designs. 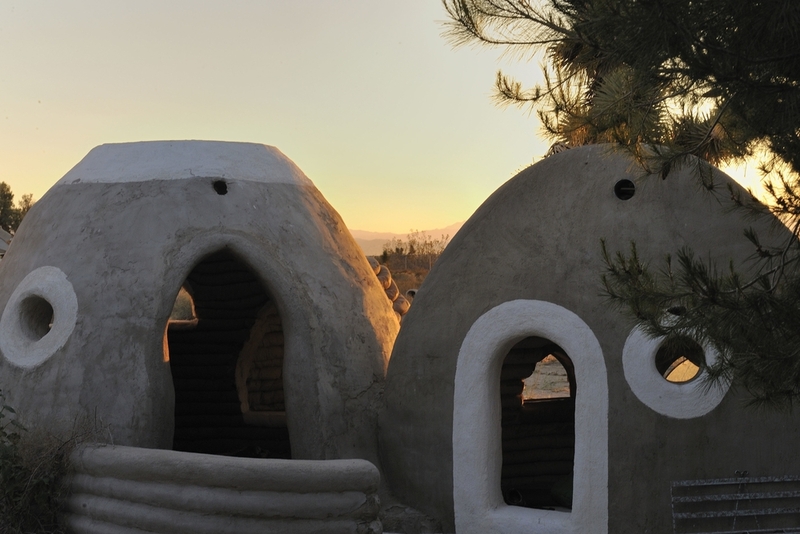 While CalEarth now focuses exclusively on SuperAdobe building designs and technology, Nader Khalili spent many years studying traditional adobe and earth architecture to fully understand its benefits and capabilities. 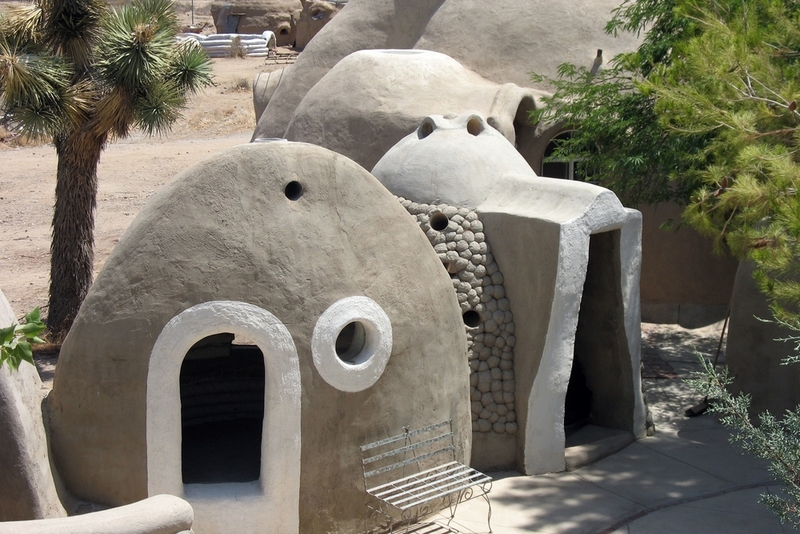 Khalili would call his structures "tangible poetry" and always shared his fascination with the universal elements of earth, water, air, and fire and how these elements combined could create beautiful and inspirational forms. 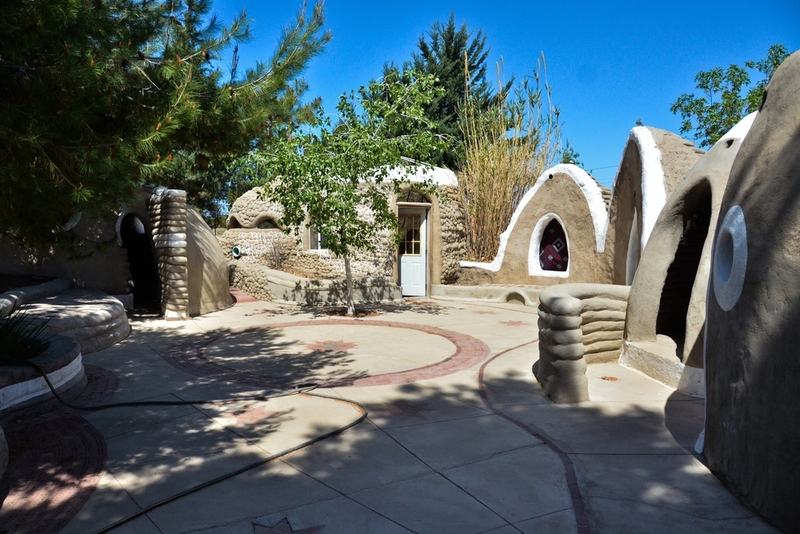 The Strawbale Dome was built in the late 1990s as a research project by students to try and combine more than one of the natural building systems. 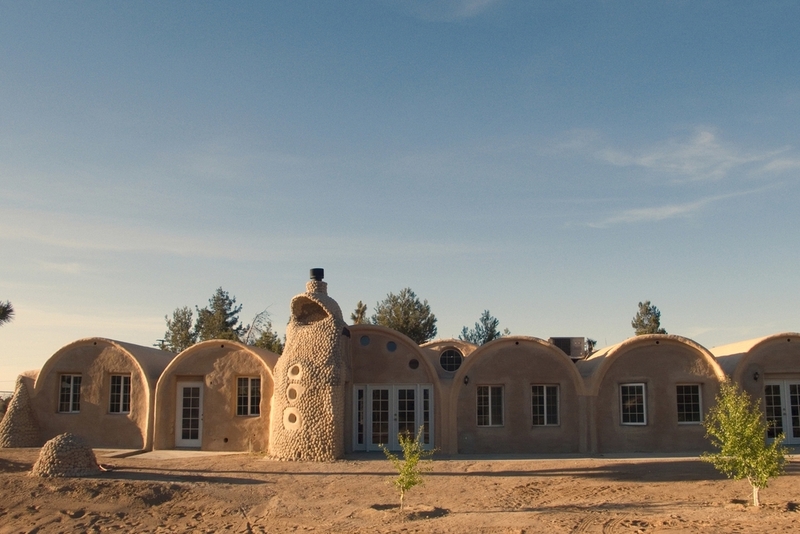 As a hybrid design, this 25 foot dome includes walls built from SuperAdobe up to 6 feet high, and then the remainder strawbale. 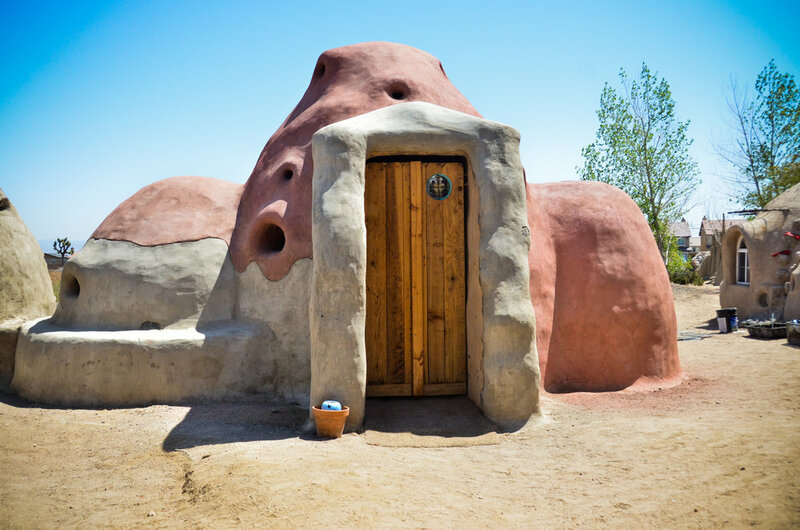 The Ceramic windows were designed and built by a student, as was the door which is made entirely out of recycled materials. 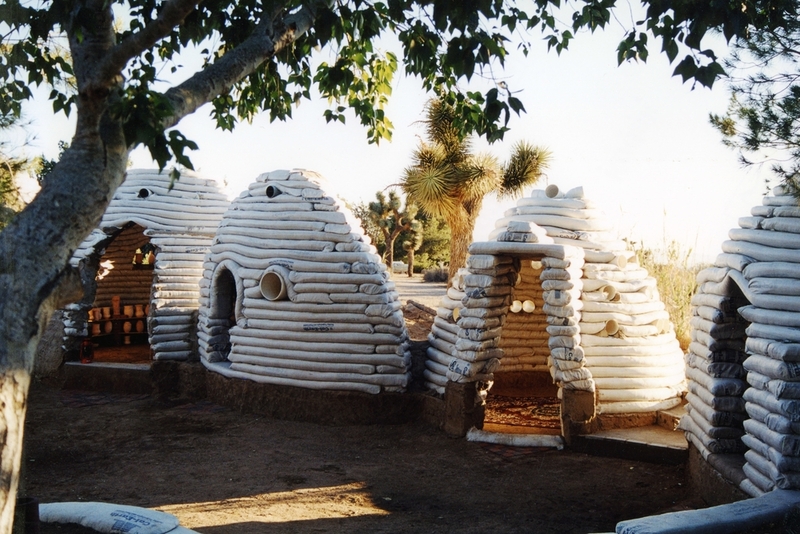 The first sandbag dome at CalEarth was built using 60 lb rice bags filled with pure earth. The material was untamped and unstabilized, and each bag was individually sewn shut. Nader Khalili used to tell a famous story about how one day a group of fire fighters drove by and wondered what was happening so he invited them in to see his work. 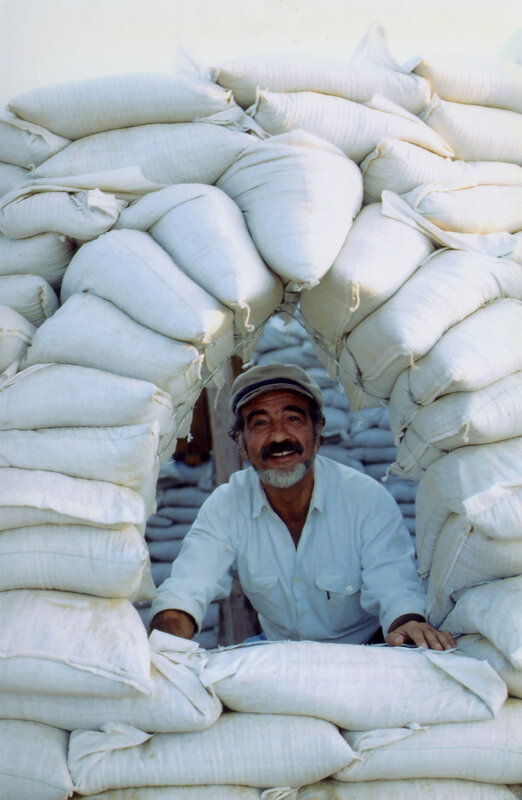 After a conversation with the fire fighters about their use of sandbags for flood control, Khalili realized his builders had been laboring intensely to fill the bags then lift them in place whereas the firefighters place them, THEN fill them! From this moment forward Khalili began teaching the "coffee can technique" which allows the bags to be filled in place one coffee can at a time, making it simpler for any one to build their own home.